ISC Paris Business School was founded in 1963 and is one of France’s “Grandes Écoles”. The school is perfectly located in the capital of France; the city in which most of the leading multinational corporations have their offices. 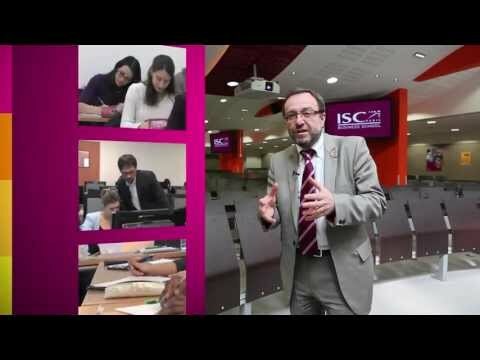 It’s ISC Paris’ mission to provide students with the necessary tools and high-level management skills to succeed in an international environment. ISC offers several degree programmes in the field of business and management. Graduates are prepared for employment in a variety of areas such as fashion, finance, hospitality, high tech, international trade, information systems, retail distribution, luxury goods, technology and multimedia. ISC Paris Business School’s Master degree is endorsed by the French Ministry of Education. The degree programmes are nationally recognized. ISC Paris has over 155 partner universities in more than 50 countries, which gives students the opportunity to study abroad in order to gain a better international outlook. Most of the programmes are bilingual; taught in English and French. International programmes are taught completely in English. ISC Paris Business School has effective and innovative teaching methods and high academic standards and places special value on imparting knowledge by preparing their students to face global challenges in their future roles. True professors having worked in the relevant industry shared their knowledge and skills with us. I really appreciated this intense period of working constantly and the efforts brought me much confidence that I use now in my professional life. If you're the owner or representative of Institut Supérieur du Commerce de Paris, you can claim this University and build a better profile. Interested in studying at Institut Supérieur du Commerce de Paris?